On the north wall of the nave is a memorial to Marye Franckyshe. It is quite hard to see the detail from ground level but fortunately we have photographs taken by Michael Hardy, to whom we are most grateful (all three © Michael G Hardy 2011). 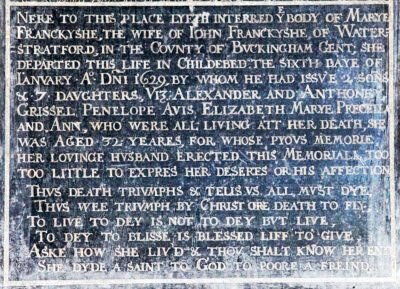 The memorial was commissioned by John Frankish (the simplest of the many spellings of the surname that we have encountered) to commemorate the death in childbirth on 6th January 1629 of his wife Mary (née Birtwistle), aged 32. John was Lord of the Manor somewhat unexpectedly as, following his father's death in 1615, his two elder brothers each died soon after inheriting the estate. Myres makes no concession to his readers' lack of Latin but H.S.I. must mean 'here is buried' (usually HSE - hic sepultus est) and it commemorates Benjamin Heart or Hart (the next Rector but one after John Mason) who died on 23rd November 1732, aged 50. This stone is still in the chancel but was missed by the grave survey conducted by the Buckinghamshire Family History Society in 1996, probably because it is covered by the southern choir stall. It is a full-length tombstone and may well mark Hart's actual burial site. 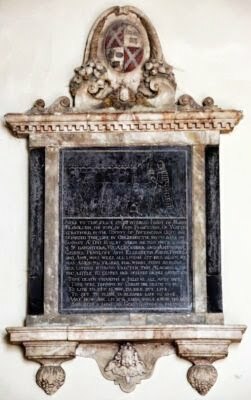 This commemorates William Henry Barnard, our Rector from 1814-18, and states that he was born on 27th January 1767 and died on 14th October 1808. The death date is wrong: presumably either Myres or the mason accidentally missed out an X in the year. Myres adds, 'This slab was formerly in the chancel, but was removed when Dr. Bosworth restored the chancel, and is now outside.' The registers show Barnard was buried at the church on 21st October 1818 but no trace of this slab or any other grave marker for him has been found. Sir John Linton Myres, 1869-1954, was born in Lancashire but became associated with this area in the late 1870s when his father, William Miles Myres, became Vicar of Swanbourne and sometime Rural Dean of Buckingham. John was educated at Winchester and New College Oxford and was a Fellow of Magdalen College from 1892 to 1895. He had a very wide range of interests but was primarily an archaeologist, working with Sir Arthur Evans at one stage, and was Wykeham Professor of Ancient History at Oxford from 1910 to 1939. Both he and his father were members of the Buckinghamshire Architectural and Archaeological Society and in the early 1890s he contributed two important articles to Records of Buckinghamshire: History and Antiquities of Water Stratford and John Mason: Poet and Enthusiast. The former is often said to date from 1891 but its heading identifies him as 'Fellow of Magdalen', which suggests it was printed no earlier than 1892. An earlier source of information is James Joseph Sheahan who wrote a series of guides to parts of England. Most concern Yorkshire but the one of use to us is History and topography of Buckinghamshire, published in 1862. Still earlier (and somewhat unreliable) was Browne Willis, 1682-1760, who was MP for Buckingham from 1705 to 1708, both succeeding and preceding Sir Richard Temple, later Viscount Cobham, in that role. In 1755 Willis published his History of the Town, Hundred, and Deanery of Buckingham.